Jason Aldean will be making history at one of baseball's most historic sites. 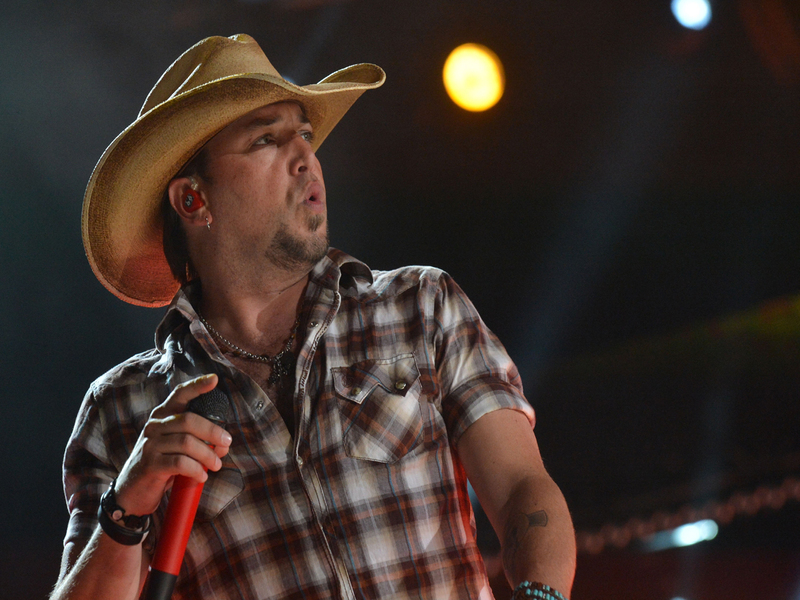 Aldean will be the first country music star to play a concert at Fenway Park, the iconic home of the Boston Red Sox. The July 13 appearance will be the initial stop on his first stadium tour. Aldean made the announcement Thursday in the shadow of the Green Monster with an assist from Red Sox President/CEO Larry Lucchino and members of the team who made a celebratory clip for the singer that played on Fenway's video board. "Being the first country music artist to ever come here and headline a show is amazing," Aldean said. "It's going to be a fun night. Over the last several years, my career, especially the touring side of that, has been pretty amazing. It's been growing. So thank you guys for having us. I can't wait for July 13." The Georgia native released his fifth album, "Night Train," this week, and it's on track to debut at No. 1, according to Billboard. That title is an apt metaphor for his career, which has been steaming along on a steep trajectory. About the only thing he hadn't attained yet was a stadium tour, and he's crossing that goal off the list. Red Sox David Ortiz, Dustin Pedroia and Jarrod Saltalamacchia welcomed Aldean in a video, and he walked out of the dugout to the sound of songs from his new album and signed the wall inside the Green Monster scoreboard. Aldean is one of country's top draws, but the stadium tour will move him into rare company. Currently, only Taylor Swift and Kenny Chesney have that kind of drawing power. But the hard-rocking singer has earned the status, selling more than 1.9 million tickets on his yearlong "My Kinda Party" tour that wraps in Dallas on Oct. 27. Aldean will be joined in Boston next July by Miranda Lambert, Jake Owen and Thomas Rhett. The area has proven to be receptive to country music. Chesney and Swift have sold out Gillette Stadium, home of the New England Patriots, several times and Aldean has drawn enthusiastic crowds at smaller venues. The 35-year-old singer is up for three honors, including top honor entertainer of the year, at the Country Music Association Awards on Nov. 1. The first single from "Night Train," "Take a Little Ride," had the highest selling digital debut for a solo male country artist and was the fastest rising No. 1 on the country song charts this year. Aldean recently made headlines after TMZ posted photos of him getting cozy with former "American Idol" contestant Brittany Kerr. Afterwards, the married father-of-two posted on a message on his Facebook page, apologizing for his behavior: "The truth is that I screwed up. I had too much to drink, let the party get out of hand and acted inappropriately at a bar. I left alone, caught the bus to our next show and that's the end of the story. I ultimately ended up embarrassing my family and myself. I'm not perfect, and I'm sorry for disappointing you guys."